ahead of trends, and operating way outside the box; I have often taken the road way less travelled. I am intense about the things I am passionate about, though I love to laugh and remain lighthearted. Health, Nutrition, Fitness, Movement & Meditation have always been amongst my main passions. I started working out with weights at age 10, was naturally athletic and applied my efforts in several athletic disciplines. I began training others at age 16, a few months before starting college (graduated a year early from HS). At the same time I started teaching aerobics, muscle toning, & martial arts classes. A few years later I added yoga asana classes to my niche and advanced my training. At 17, after rediscovering Yogic Philosophy & reading "Survival into the 21st Century" by Viktoras Kulvinskas, followed by many other books the subject of health and diet, I gave up red meat, followed by giving up chicken, turkey, fish and eggs a year later. I lived vegan for about 5 years with over a year just on raw foods, until my body started asking him for yoghurt and I added organic dairy back into his diet in small amounts. During and since that time, I read and digested at least 1000 books on the subject of health, diet and fitness, while going to study personally with giants in each of those fields. I have always found the most value though in applying what I learn to my own life, testing things out for myself, innovating them further and then sharing my discoveries of what works with others. This is what drove me to the important work of instructing and sharing health, diet and fitness to this day. fields, creating quite a stir. That was a great deal of fun! I later became the Nutrition & Fitness Editor of an even greater Health & Fitness publication called Healthmap, having a column regularly read by 500,000+ people. In 1997, pending the birth of my first daughter, Kanyakumari Devi, I moved back ( I lived here briefly in 1993-94) to tranquil vibrations of one of the latest little surf towns left, Leucadia, California, home to meditators, surfers and artsy folk. I then started my business over once again, moving beyond its original title and scope of "Holistic Personal Training", to its current upgrade of WOHLISTIC Personal Training. After all, "Beyond Holistic is WOHLISTIC!!!" Turning 46, on Dec 16, 2013, I am going Stronger than Ever! 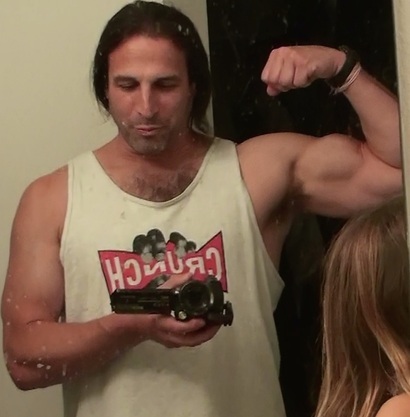 As a strict vegetarian for the last 28 years, I am living proof that you easily get more than enough protein to build muscle on a plant-based diet, and that it gives you boundless, vibrant energy allow you to feel incredible! I realize that everyone is on their own path, and needs an individualized approach, with many not having an interest in following a vegetarian diet, so please don't take that as a requirement to work with me. I work from where a client is at, and provide the best structure within your framework of comfort. I can design optimally effective dietary plans that include animal products, just as easily as the various forms of vegetarian ones. All Key Elements to the Wohlistic Way!